If you’re interested in muffler men it’s very likely you have run across these guys known as “Big Johns”. They are the step brothers if you will of muffler men and although they are not related by “blood” they seem to be part of the extended family. 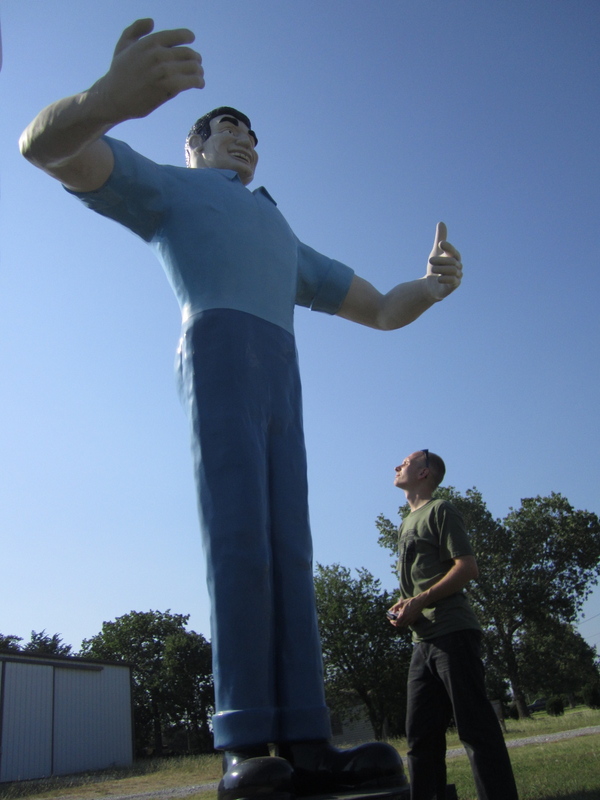 Standing over 5 feet taller then muffler men they are some of the largest giants mass produced back in the golden age of the 1960’s roadside giant architecture era. Their roots are far from the streets of Venice California and they were made in Cape Girardeau, MO at the General Sign Co. Back in 1960 two men Bob Martin and Frank Bayley formed a partnership and started opening grocery stores in rural southern Illinois towns. After about 7 years they started placing giant statues at their store locations. General Sign Co. started turning out the Big Johns around 1967 and I am guessing 10-15 were ordered altogether. These guys are taller and much heavier then muffler men and each of them held 4 giant grocery backs in their arms. The original paint job included a checkered shirt with an apron painted on. The grocery bags were filled with large fiberglass grocery’s and in some locations name brand stickers even appeared on the outside of the bags. At the peak of Big John’s Grocery they had locations in much of southern Illinois as well as a few stores in Tennessee and Kentucky. There is a statue in Cape Coral, FL but I am not sure if that is because there was a grocery store there at one time or it was just purchased and moved there from Illinois. Today there are 9 left that I know of an 2 of them still stand at operating Big John Grocery stores in Southern Illinois. In the 70’s Bob Martin and Frank Bayley slowly moved out of the grocery store industry and started Hucks Gas stations and convenience stores that now cover much of Illinois. As the grocery stores started to close their doors the giant grocery clerks were sold at auctions and start appearing at other businesses. Some have stayed in the grocery store ocupation like the guy in Carmi, IL that stands in front of the Little Giant Grocery Store. In Lakeview, MS one stands on the state line at a seasonal fireworks stand while another guards a strip mall in Florida and was just recently repainted. They have also become popular with collectors and 4 of them can be found today in private collections. 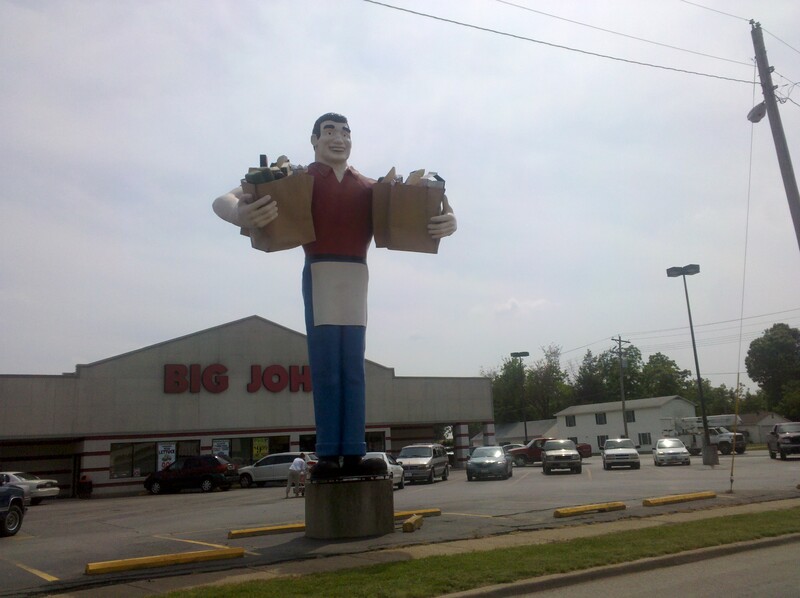 There is a Big John in St Louis, MO that is currently in two pieces. Also the former Benton, IL Big John is now part of the Farnham collection in Ungar, WV. And of course there are the two huge Big Johns that now live in Gainsville, TX and are part of Glen Goode’s giant family. Glen’s Big Johns came from the few grocery locations that were in Tennessee and he picked them up off their backs in an empty lot after the closing of their stores in the 80’s. His Big Johns no longer hold their grocery bags but he still has them in storage. I hope to one day learn more of the story behind these giant grocery clerks and find out exactly how many were made, perhaps there are more that still exist that we have not found yet. Although often confused with muffler men these guys are a breed all of their own and along with what is known as the Beach Guy they tower over their muffler man friends. 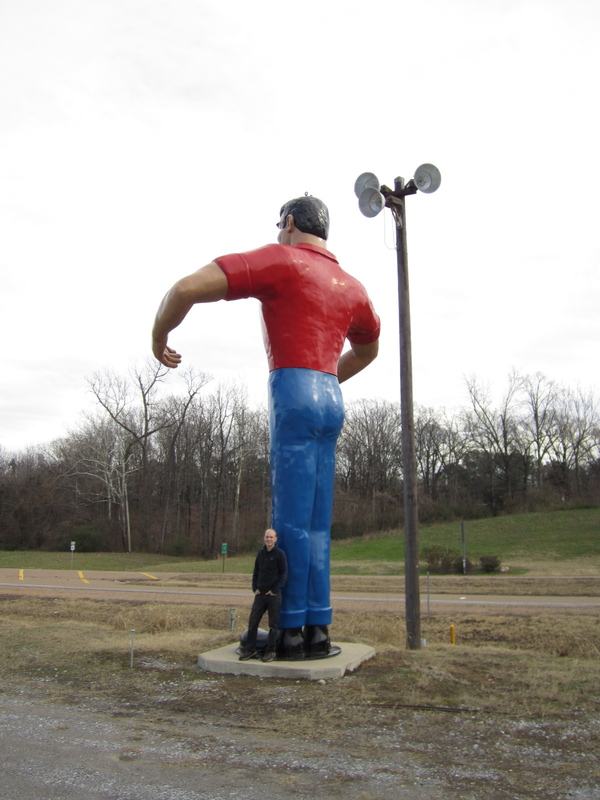 Recently Roadside America did a story on me and mentioned “my rules” of what constitutes a muffler man sighting or not. 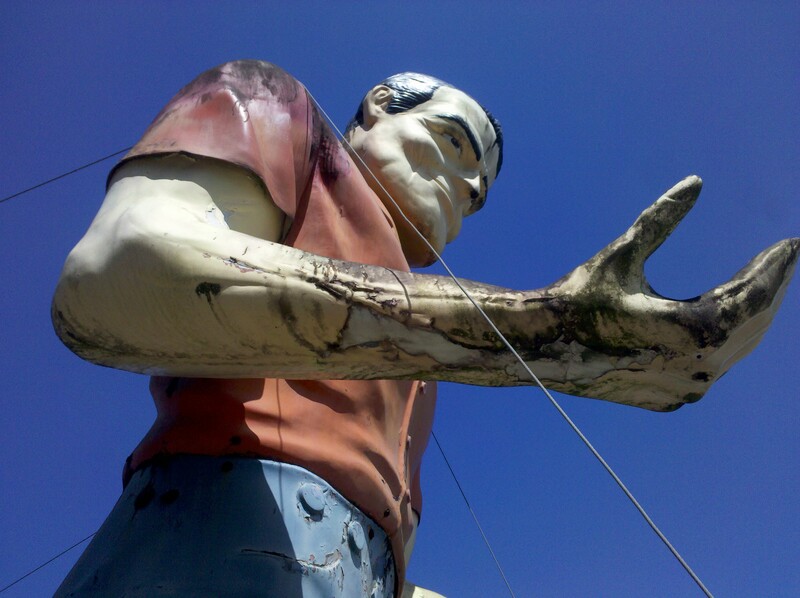 I don’t count my Big John sightings as muffler man because they were made by a different company. However I do count Uniroyal Gals and the smaller bunyans because they were made by International Fiberglass. I bend the rules a bit for copies of muffler men if they are exact because although not made by I.F. they still look like muffler men, for example Mark Cline’s soda jerks all get a # on my list. Special thanks to Debra Jane Seltzer for the use of her picture of the Farnham collection in Ungar, WV that includes the former Benton, IL Big John. In the late 90’s Roadside America started appealing to it’s website visitors to help find more uncharted muffler men. The tips poured in from across the states and the real scope and reach of muffler men started to be realized and seen as Roadside America built their online map. Among the reports were a few out of country sightings that also made it on to a special page. When I started my hobby I discovered this and made a mental note of the few muffler men who dared cross our border. There are a small handful of muffler men that have migrated to Canada and Mexico and then one in Panama, Italy and Puerto Rico. The one in Panama has been photographed so I knew that sighting was good but the other two tips did not include pictures which often means it can be a case of mistaken identity. For a long time there was a report of a muffler man in Nashiville TN but after I visited the location I discovered it was a man made out of mufflers that had once lived at the location. I figured this was the case in Puerto Rico but decided to investigate on one of my business trips to the country in February of 2012. 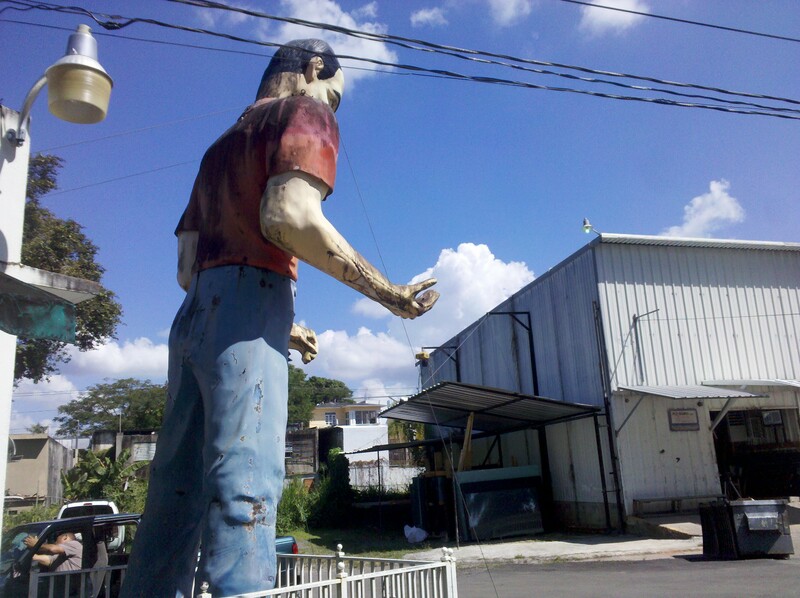 In 1999 a report had come in to Roadside America stating that one was in Caguas. It reported the giant to be a service man version and stood on the back lot of a auto body shop. I arrived in the city early in the morning and started showing locals a picture on my cell of the muffler man in Washington, GA that I figured would most closely resemble the one reported in Puerto Rico. Sure enough the locals started nodding their heads and pointing (because I don’t speak a lick of spanish) and thats when I knew we might have something here. Following the directions given led me right to the shop mentioned in 1999 and when I pulled in I saw the muffler man standing at the back of the lot well off the street. I quick talk with a worker gave me his history and also that of it’s owner. 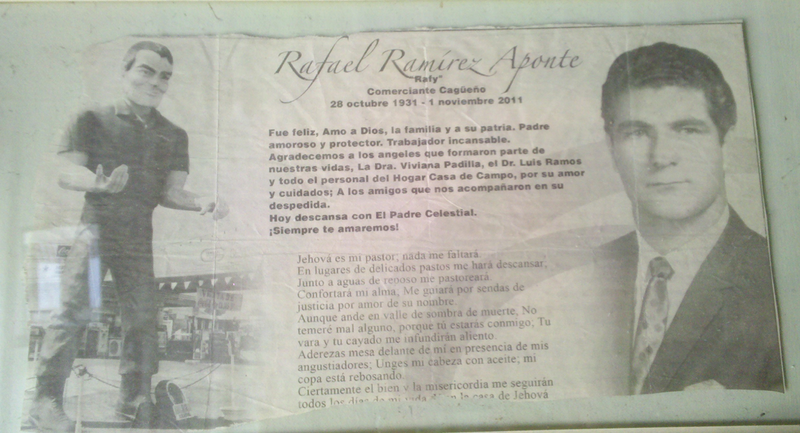 It appears a man named Rafael Ramirez Aponte owned a gas station in Caguas in the 60’s and during that time visited a trade show in California. That is where he met International Fiberglass and their big men. He purchased a service man version of the muffler man and had him shipped on a freighter to Puerto Rico. 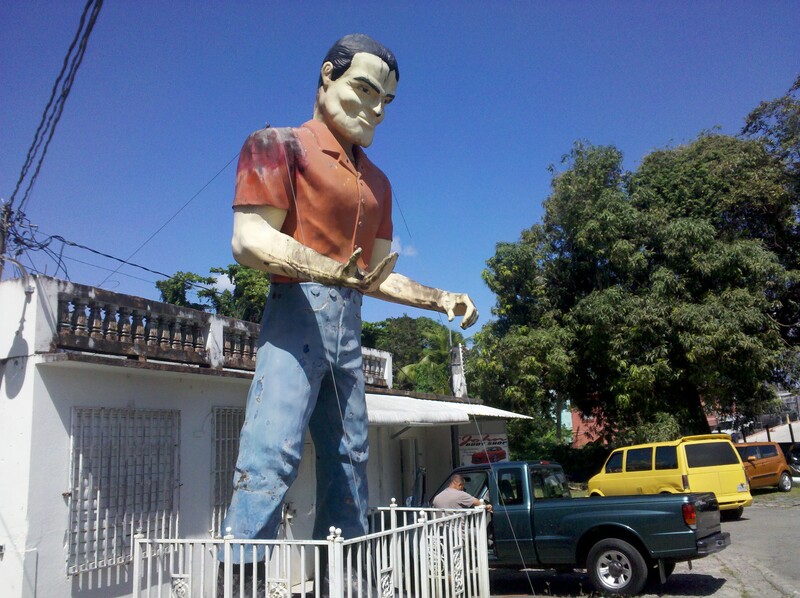 Once the giant arrived he was trucked to the inland city of Caguas and set up at the owners gas station where it stood for many years. 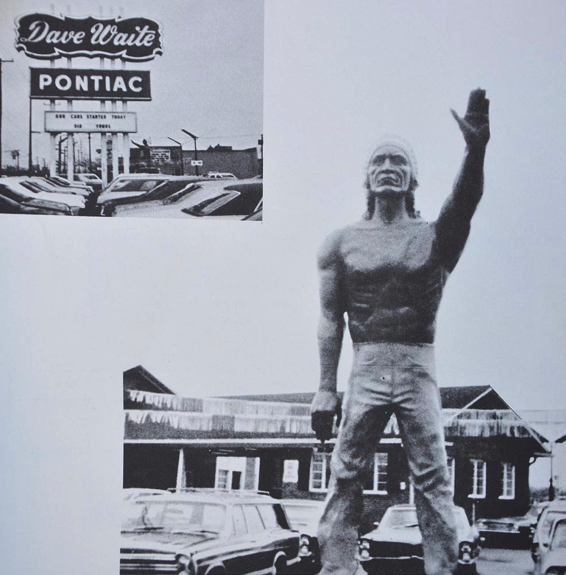 Most adults in the area who grew up in the 60’s and 70’s remember the giant standing in front of what I think was a texaco station. 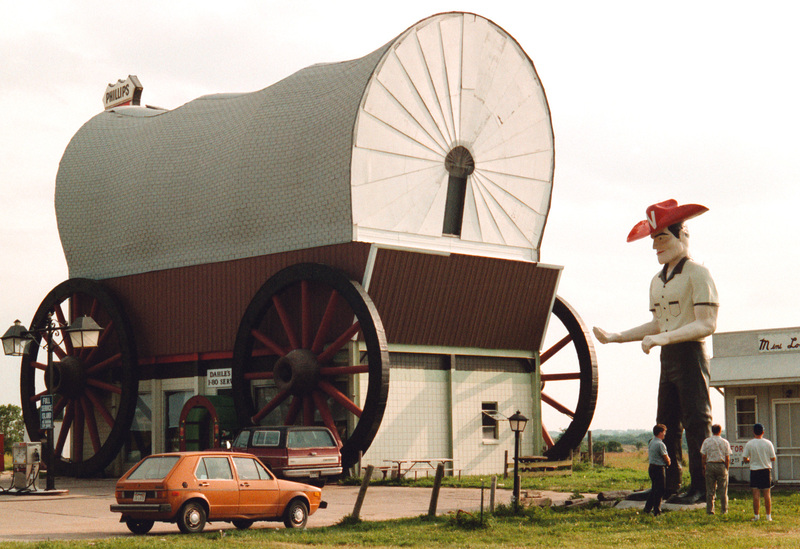 Sometime in the 80’s the giant was moved to the owners auto shop and set up on the back part of the property where he still stands today. He has been painted many times and like many things in Puerto Rico has darks water stains on him from the almost daily rain showers. He is one of the earlier muffler men produced by IF judging from the way his arms fit into the sleeves. Also interesting to note is that his legs are bunyan with the suspender buttons and pant legs tucked into the top of the boots. 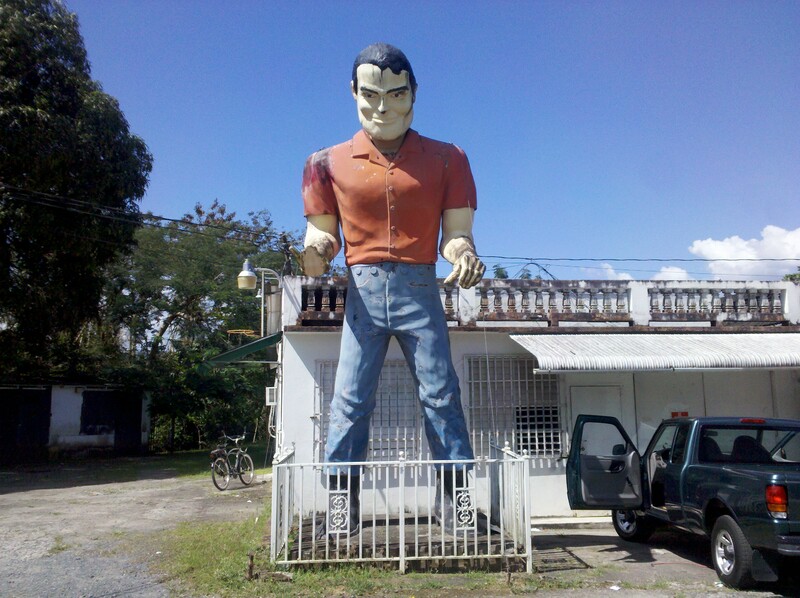 The locals seemed to be suprised to learn there are hundreds of them in America since they were under the impression they owned the only one and that his faced was modeled after the owner Rafael who passed away in late 2011. 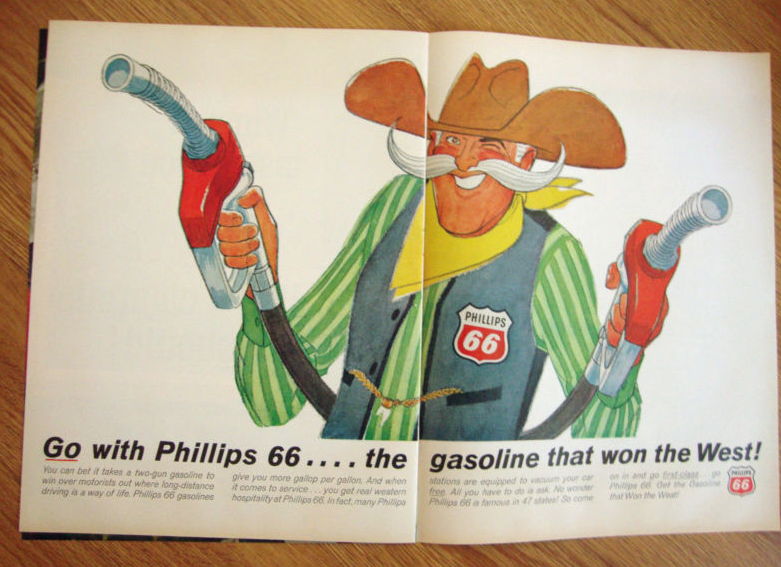 In the mid 1960s Phillips 66 petroleum initiated an ad campaign around the slogan “Go with Phillips 66… the gasoline that won the west”. 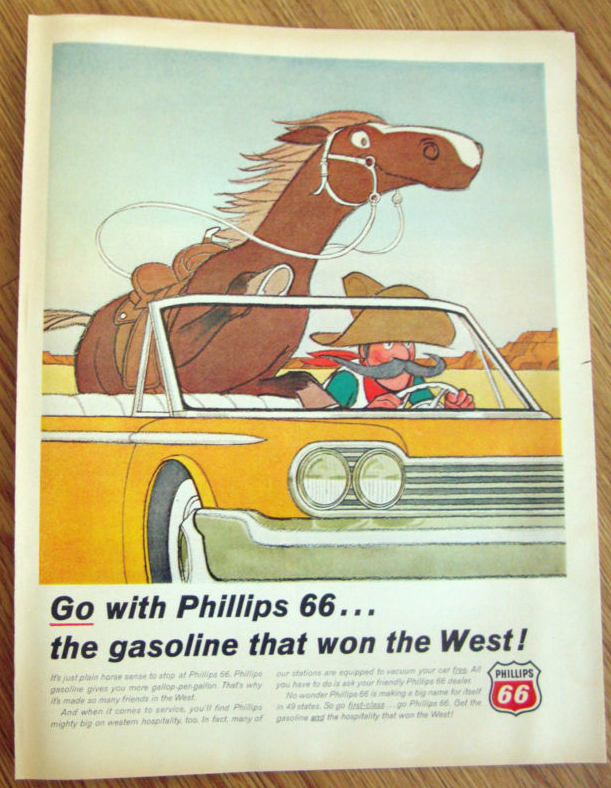 The ads featured images of cowboys along with some snappy copy that talked about Phillips’ “down home hospitality and service”, as well as their gasoline’s performance, which they claimed “gave you more gallop per gallon”. Motoring at this time was still a major recreational activity for most Americans and Phillips effectively used cowboy imagery to symbolize the “freedom of driving on the open road”. Much like the American cowboy who had rode west and tamed the wilderness, Phillips aligned itself with the cowboy mystique, aiding adventurous 1960s travelers as they made their way westward. As we all know a number of muffler men were put to use in conjunction with this campaign. 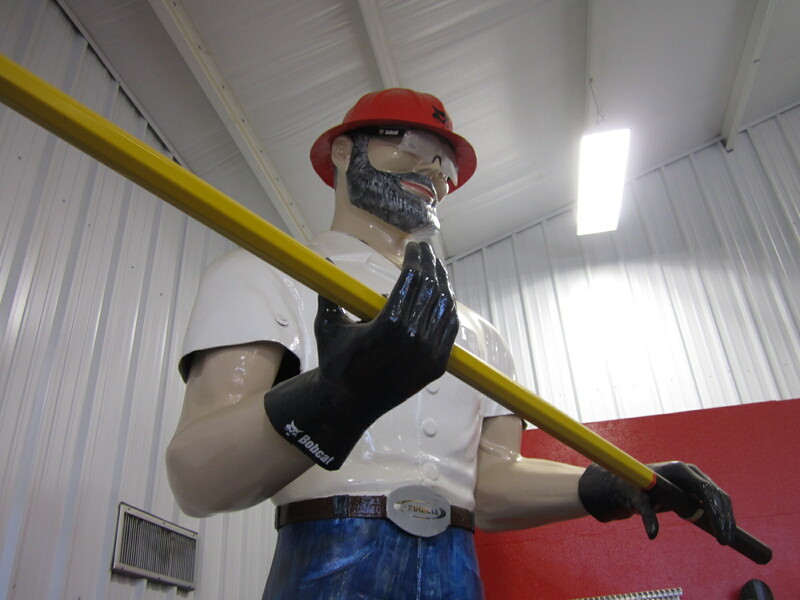 I’m not sure if International Fiberglass created a special version of the muffler man for Phillips or not, but we do know that a standard Phillips 66 cowboy had a hat and rolled up shirt sleeves… sporting Phillips 66 logos on their breast pockets as well as on the front of the cowboy hat. In some shots one can see cowboys wearing a holster and six shooter, there has been some speculation that some also carried rifles, but I have yet to see an example of this. Through my research I’ve come across a number of vintage images of various Phillips 66 cowboys, all of which are long gone. Luckily for us a few of these muffler men ended up on promotional postcards created by the proprietors of these stations. One of the nicer ones I’ve seen was used to promote Vaughn’s Phillips 66 Station located on Highway 20 in Fort Dodge, Iowa. 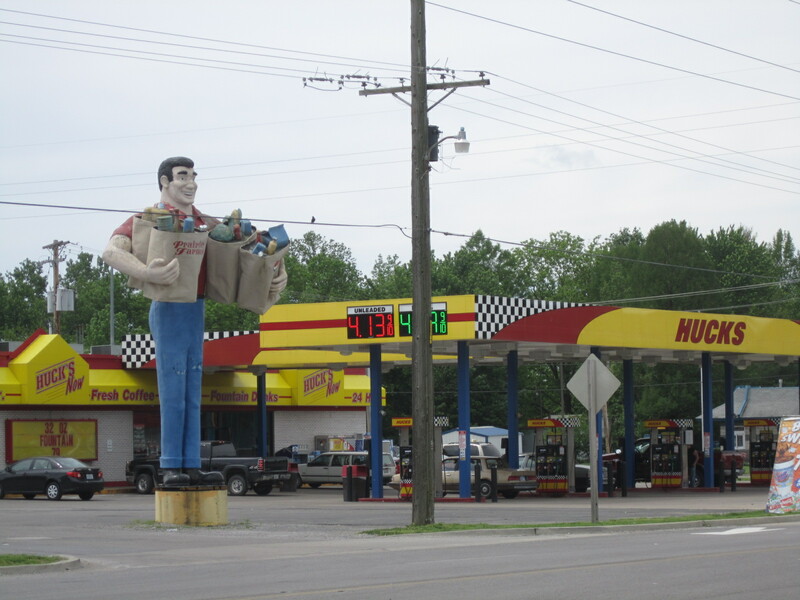 I have no idea whatever happened to this muffler man, but it’s a great example of roadside vernacular especially with that huge mutant head located on the roof. 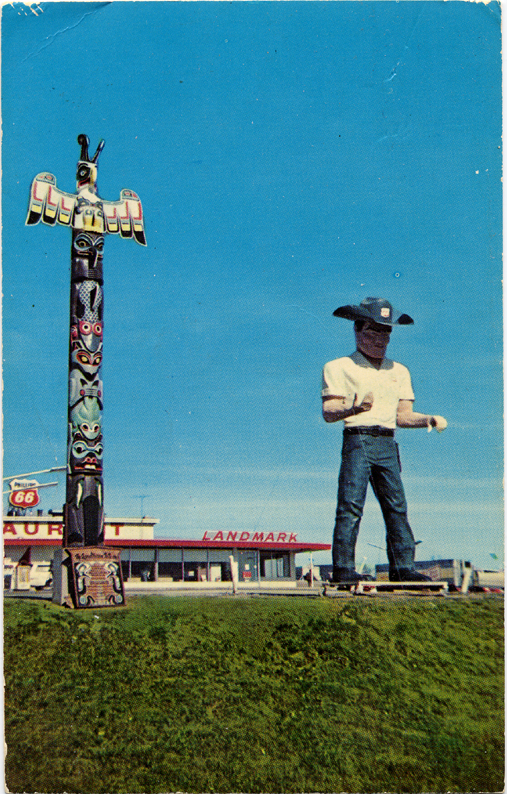 Another Iowa cowboy can be seen on this postcard from the Landmark Truck Stop and Restaurant, located in Williamsburg. This restaurant is still in operation today but unfortunately the cowboy is long gone. Locals referred to him simply as “Phil” – he must have had some impact because as you can see he even made his way onto their matchbooks! There is also a well documented Phillips 66 cowboy which was located in a station next to the Aladdin Casino in Las Vegas in the mid 60s. Gabriel Aldaz devoted a whole chapter in his book “Right Palm Up, Left Palm Down” on his attempt to find this particular cowboy , unfortunately he was unsuccessful in obtaining any relevant information about his current whereabouts. Editors Note: It seems most cowboy versions left today were at one time Phillips 66 Cowboys. Many have lost their hats and are mistaken for the service man version when in fact they were once Phillips 66 cowboys. The cowboy hat was made from a simple mold they made at International Fiberglass and because it’s so thin and fiberglass becomes brittle over time they often crack and fall apart and are long outlived by the cowboy. Very few left today still have their six shooters on their belt. These were often the first items to “walk off” and I only know of 3 that still have their six shooters. As Roger mentioned, it has been reported that they also carried rifles although I have yet to see a vintage picture of this. A few hold rifles today and when talking to Marvin Hawk who used to own a cowboy m man in Roseville, IL he stated that when he got his muffler man from a western store in Monmouth he was wearing a cowboy hat and holding a rifle. Some cowboys still are standing on the platform patented by Steve Dashew like the cowboy at the top of this article in Wendell, ID. This would support the idea that these cowboys did move around from gas station to gas station as part of a ongoing promotion by Phillips 66. I have heard it said that the area reps were less then excited about these muffler men as moving them about from site to site was not a “fun activity”. Today very few if any still wear their original stickers but if you look closely at the cowboy in Wendell you can still make out the outline of a Phillips 66 sticker and a time gone by. Special thanks to Roger Bywater for his contribution to this blog. All pictures used with permission from a private collection. This one was a long time in coming but finally figured out where he was and sighting #33 became a reality. 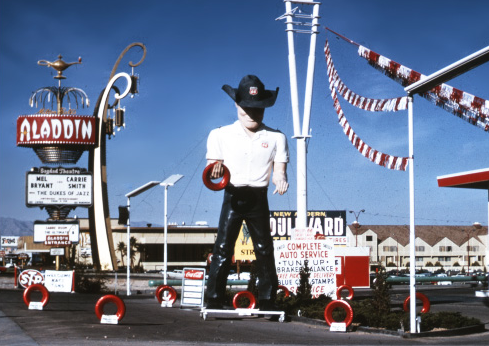 I came across a picture on flicker one day during my weekly internet muffler man hunt that I didn’t recognize. He was called the “Ledwell Giant” and was said to have once lived on top of a tall platform at a truck stop off the bypass in Texarkana. It seems he had disappeared around 2004 and a few people in the comment section where interested in what had happen to him, as was I. Some time went by before I saw another picture of him, this time indoors and with a complete makeover. I soon discovered he was at the same location but indoors and a few months later stopped in to check him out. 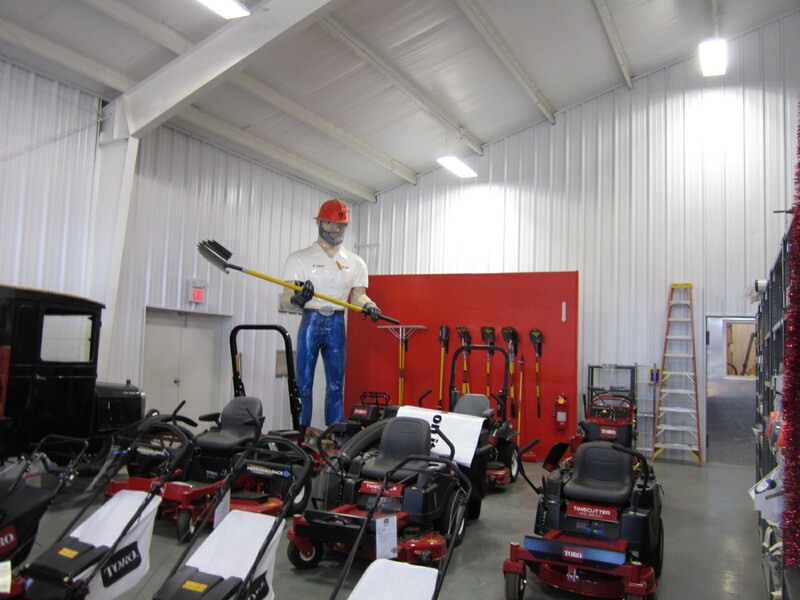 The Ledwell Machinery company has been around since 1946 selling all kinds of yard and construction equipment ranging from toro lawn mowers to chain saws and font end loaders. I’m not exactly sure if they owned this place when it was a truck stop but they have been in this building for awhile now. Before that this lot was busy with semi’s pulling in and out all day from the nearby highway. A tall poll on the property once held a small building where a man would monitor the yard and help truckers in and out of the parking lot via CB I imagine. Next to the building on the catwalk stood the muffler man. Locals guess he was put up sometime in the 70’s until finally coming down in 2004. 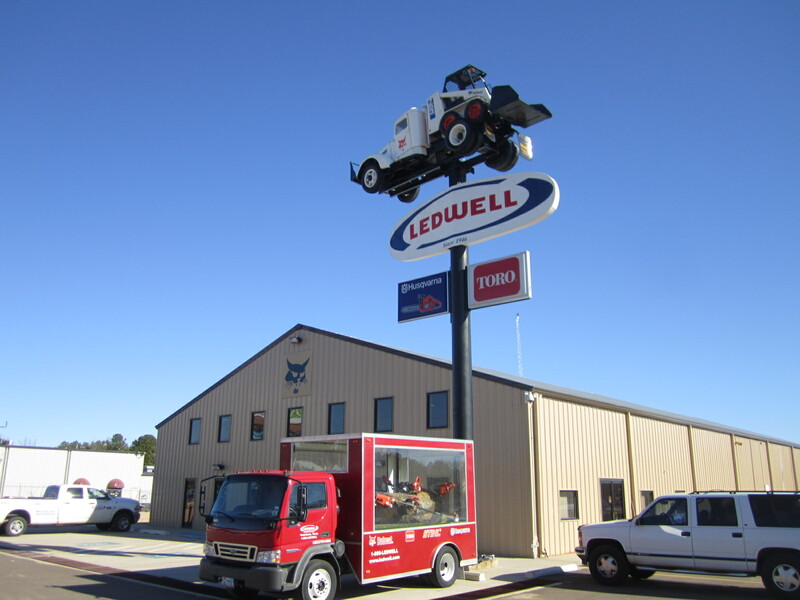 Ledwell took the building off the poll and replaced it with a full size truck and then hauled the muffler man inside where their guys did a full restoration on him. I don’t think I’ve seen any other muffler man get a makeover like this one. They went all out and gave him pencils for his pocket, Bobcat safety glasses, work gloves, a new belt and a giant shovel to hold. 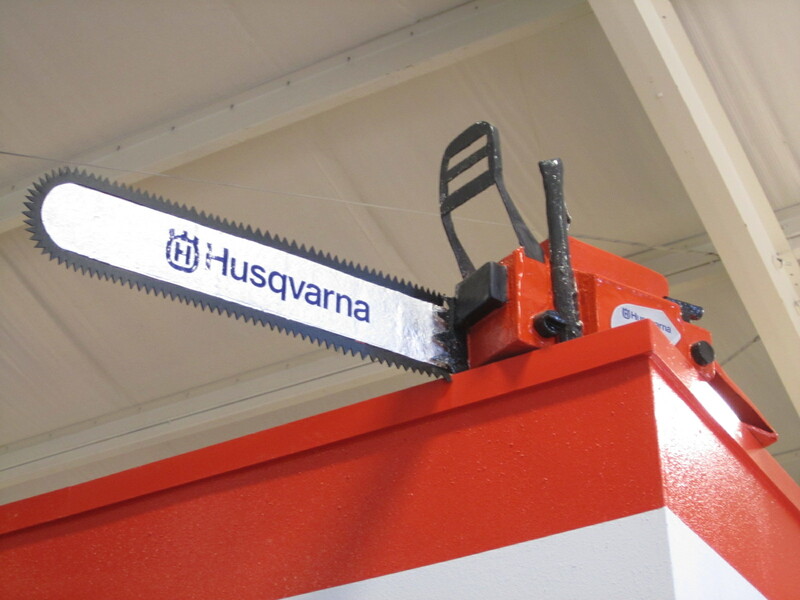 They even made a chain saw for him but it now sits across the room on top of a wall. He also got a new paint job but you can still see the “International Fiberglass” stamp on his leg. The guys that work there are great and took the time to tell me a little about his history and upgrades. About the time I felt I had a pretty good grip on what was and what was not a muffler man I started seeing these guys. 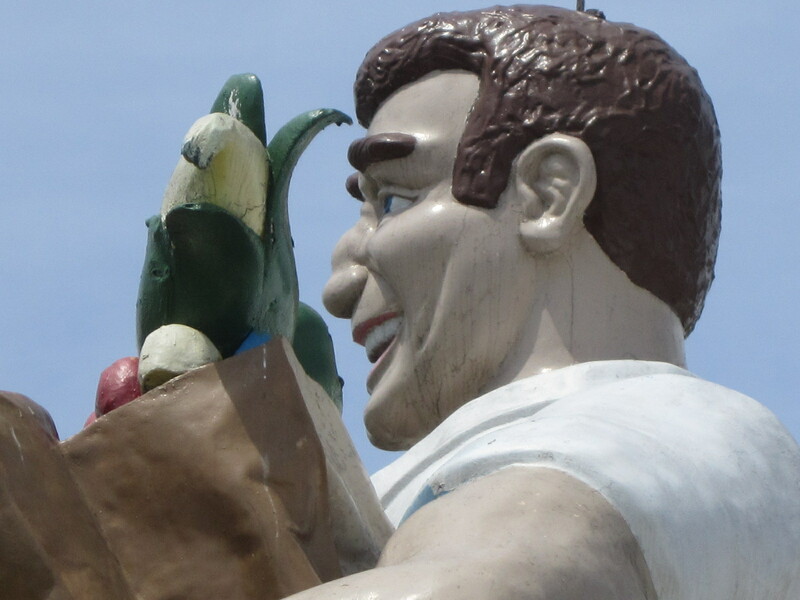 Yet another mystery in the history of the International Fiberglass muffler man saga. Roadside America when starting to document muffler men also started running into these guys. Although they look similar they are a totally different mould and size and when I first started to see them I questioned if they were muffler men at all. That question was put to rest on my #23 sighting in Sutter Creek, CA just north of Jackson. I had been working for the week in Sacramento and got some free time to take a drive out in the country to the east and see this guy. 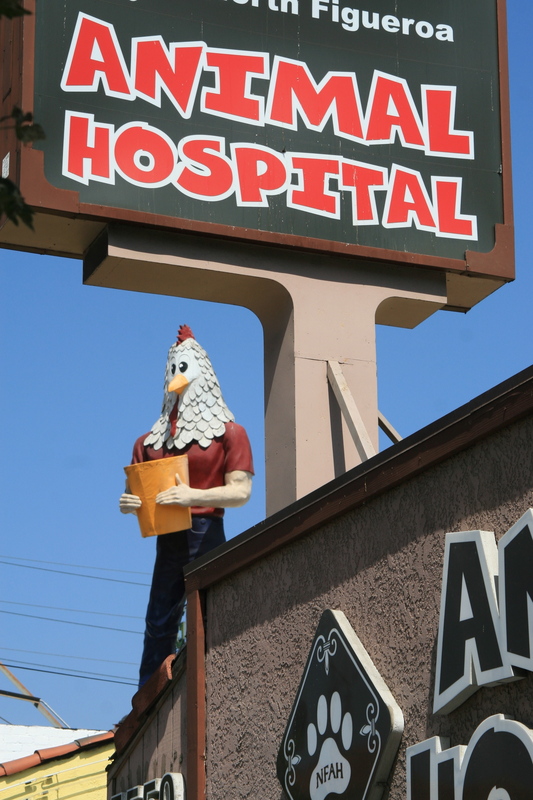 Roadside America had not reported a sighting since 2005 so I wasn’t sure if he would still be there or not. 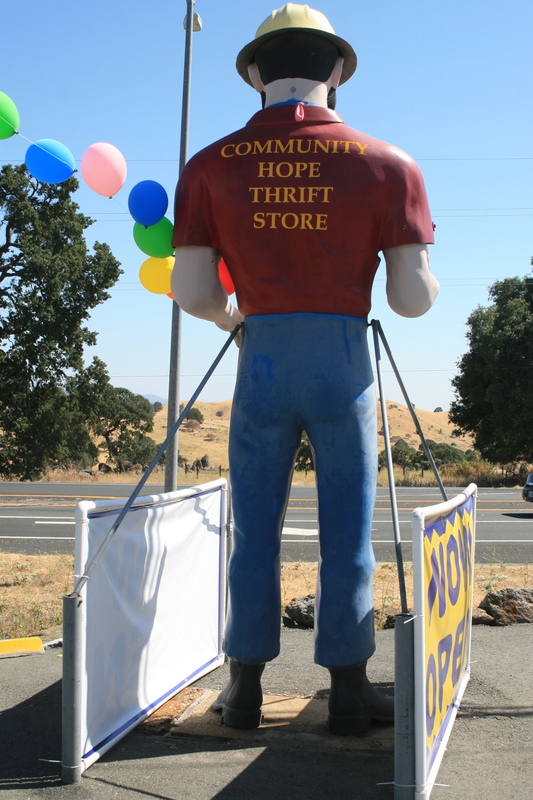 I found him in good shape and holding some nice balloons to to announce the opening of the thrift store he stood at. He also bore the name of the store on the back of his shirt.This came as a bit of a surprise since for years the business had been a equipment rental store I believe. I still have yet to do my homework on this one and contact the owner. At the time I was there the owner was renting the building to the thrift store people and he allowed the M Man to stay. From my understanding this guy has been in the area since the 60’s and always has been with the same owner. I have yet to find out if this mould was built by Bob Prewitt or International fiberglass but any doubt about him being a muffler man was put to rest when I noticed the “International Fiberglass” raised letters on his leg. It’s not the exact same logo that appear on the larger muffler men but IF all the same. So for some reason IF started selling not just the standard 22 ft muffler men but these smaller versions as well that are actually a completely different mould. I have heard they are around 15ft high but have yet to measure one to be sure. They also really don’t have a name to separate them from their taller counterparts and both models are called muffler men. For the most part they are the same idea, a lumberjack holding an axe with most often a red shirt and blue pants with suspender buttons on the pants. However these shorter versions often have a hat that looks more like a jungle pith helmet then something Paul Bunyan would wear. They also came without a hat but if one is wearing a hat it is always this same hat. As with the other Bunyans the pant legs come to the top of the boots and the shoes are similar. These versions are more rare then the taller ones and although I have yet to do an official count I would guess there are only around 20 of these left standing today, perhaps less. Interestingly International Fiberglass made another version of muffler man based on this mould and it is known today as a soda jerk. The original stood in Roanoke VA for years before being purchased by an artist named Mark Clien who runs Enchanted Castle Studios and builds and modifies hundreds of fiberglass animals and figures. Mark made a mould from the original soda jerk which held an ice cream and hamburger and today he occasionally sells them on e-bay. His copies can be found in OH, IL and CA. 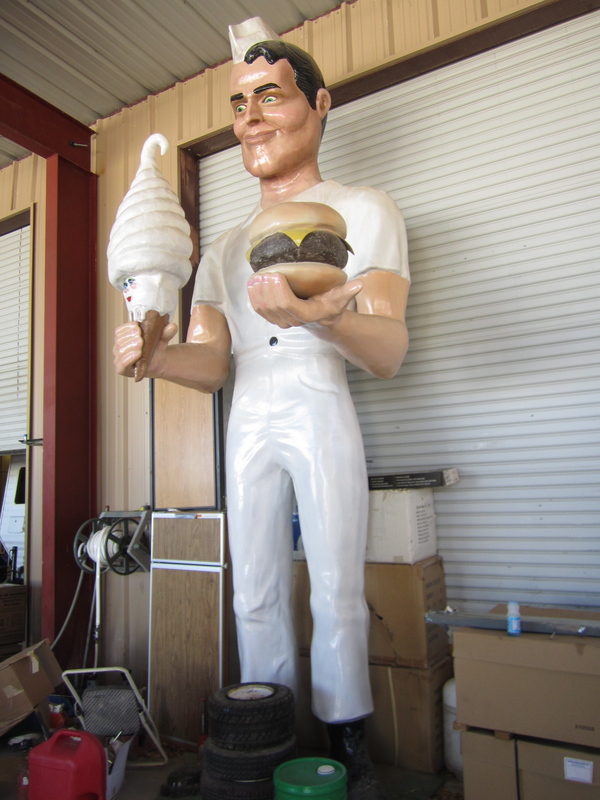 Hopefully in the future I can meet Mark and get the scoop on his soda jerk and also a muffler man head he has floating around his studio. 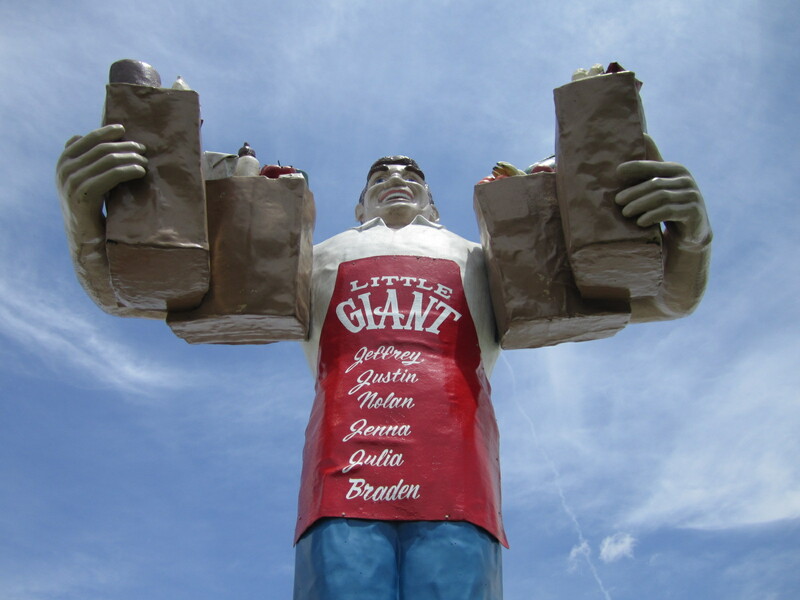 Muffler Men are giant, hollow fiberglass statues which were built from 1963-1972. They were about 22 feet tall, depending on the model. 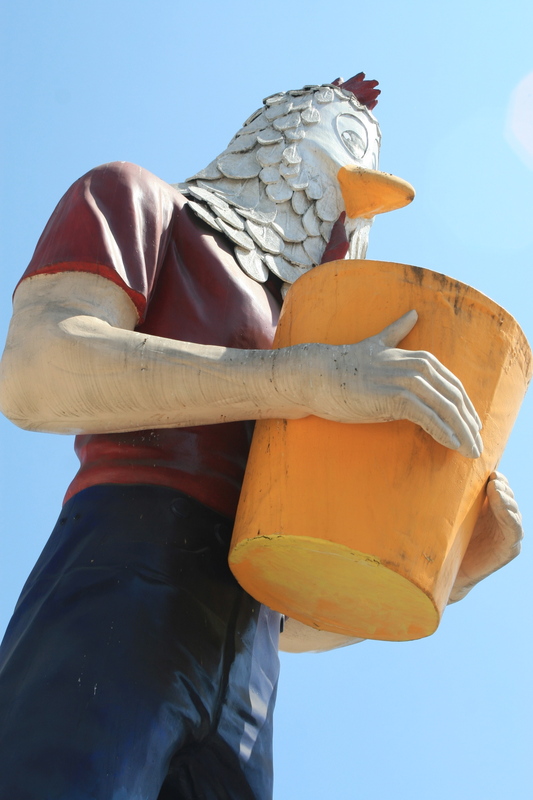 The statues were produced in Venice, CA by International Fiberglass which simply called them Giant Men. The Muffler Man name wasn’t coined until the 1990s. 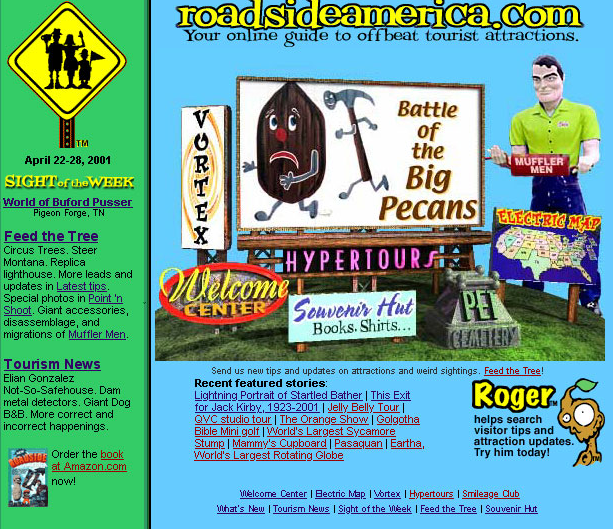 The founders of RoadsideAmerica.com began cataloguing offbeat attractions around the U.S. in the mid-1980s for their first book, “Roadside America.” The trio, Doug Kirby, Ken Smith, Mike Wilkins, began to notice the similarities between many of the statues. There were probably 20% more of them around then than there are now. 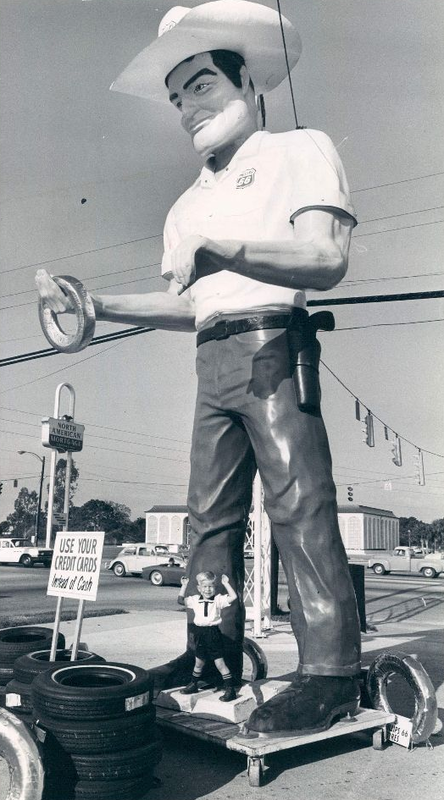 By the 1992 release of their second book, “New Roadside America,” they had about 12 of these statues in their database. While they were amused by the statues, they hadn’t covered them yet. However, they privately began calling them “Muffler Men” since a few of the statues they’d seen held mufflers. 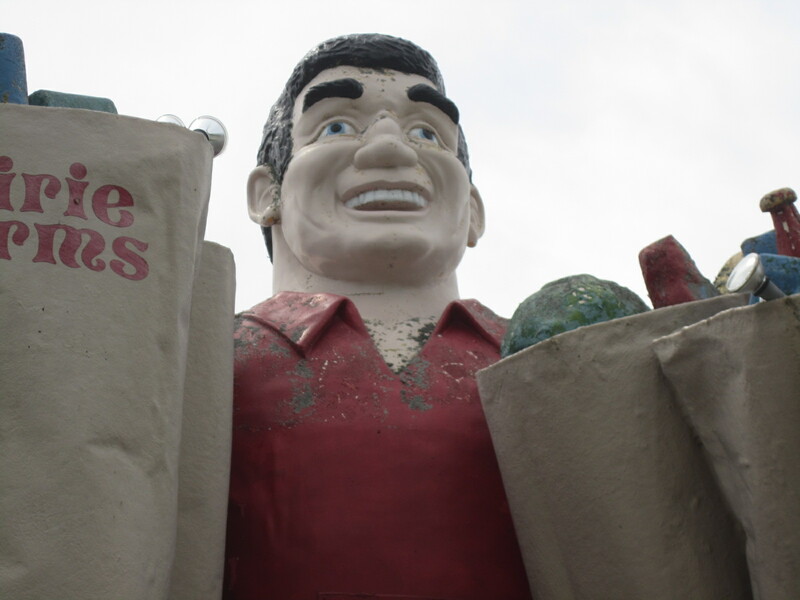 In 1996, when Kirby, Smith, and Wilkins launched the website, RoadsideAmerica.com, they included a section called “The Secret Plot of the Muffler Men.” Sightings and photos of these statues began pouring in from the website’s visitors. A map and on-line database were created at RoadsideAmeirca.com to document these statues around the country. 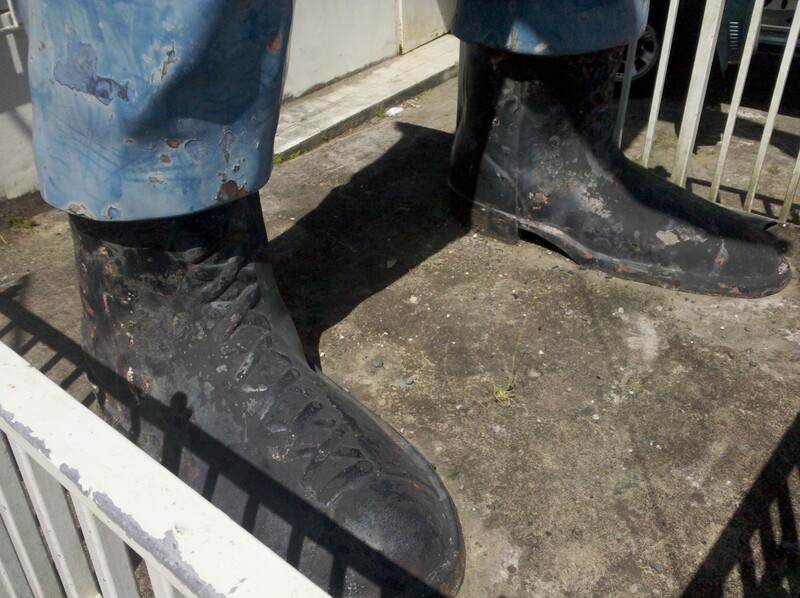 The website continues to receive tips about new Muffler Man discoveries and updates about these statues from visitors. While it is rare that a undocumented statue is found, occasionally, one will emerge from storage or be found in a remote location. 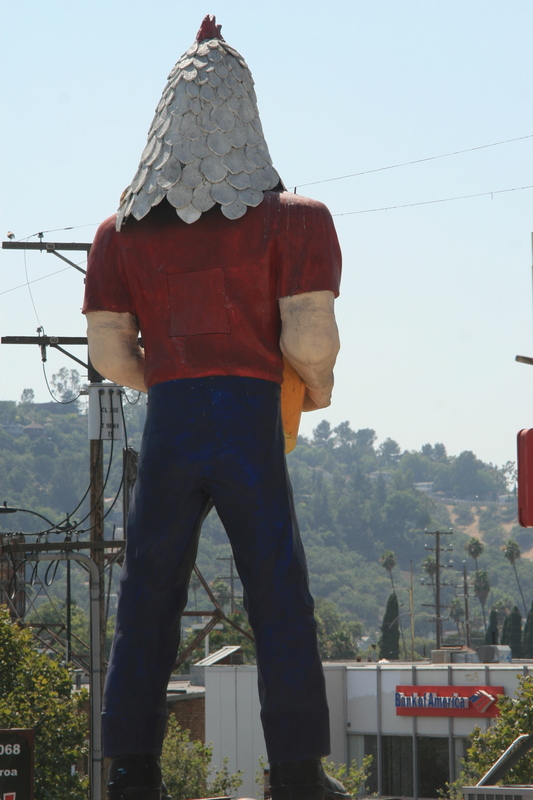 The first Muffler Man statue was created by Bob Prewitt in Lawndale, CA. His business, Prewitt Fiberglass Animals, produced many of the giant chickens, pigs, buffalo, horses, and other animals still seen around the country today. 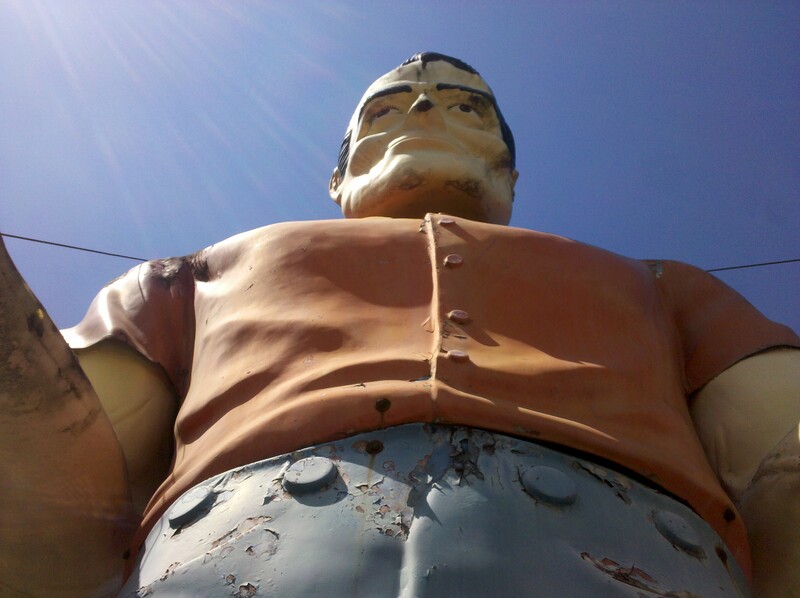 Around 1962, Prewitt got an order from someone in Sacramento, CA for a 20 foot tall Paul Bunyan statue. However, the owner never paid for it. 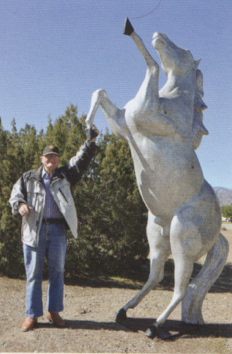 The story goes that Bob hit the road with the statue on a flatbed trailer. Supposedly, he headed east on Route 66 and went looking for a buyer. He happened upon the Lumberjack Café in Flagstaff, AZ and sold the statue to them. 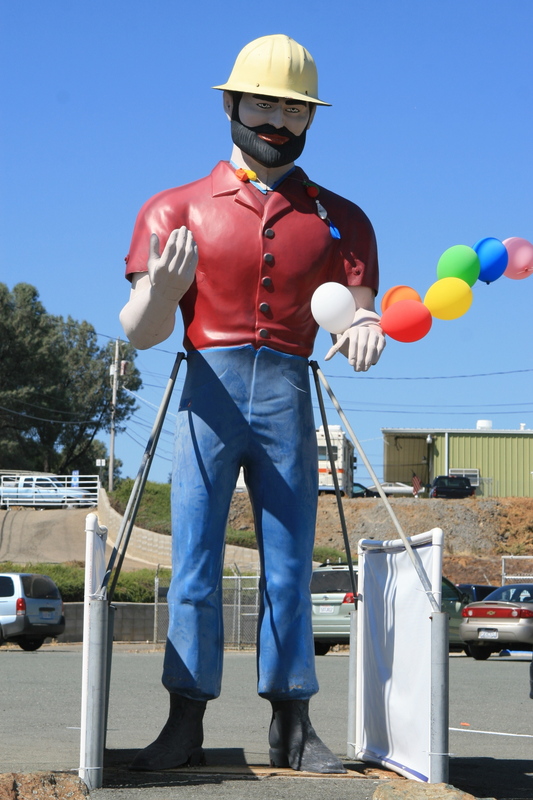 It is not known if Prewitt made more Paul Bunyan statues after the first one but it seems likely. However, his focus was on selling fiberglass animals. In 1964, Prewitt sold some animal molds and the one for the Paul Bunyan to Steve Dashew’s father. Dashew owned a boat business but needed more work. Since he was already skilled with fiberglass, he thought producing some statues might be a good way to boost sales during the slow months. 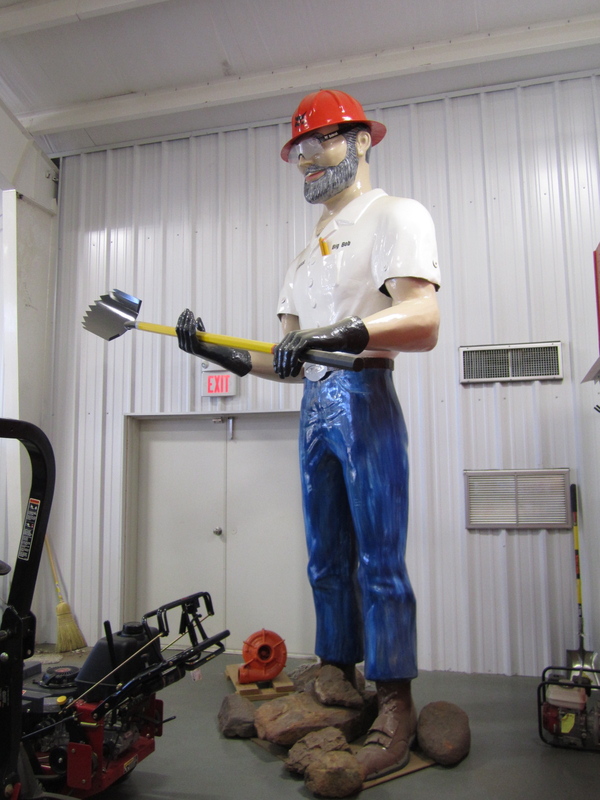 A trade magazine article about the Paul Bunyan statues sparked the interest of gas and tire companies. 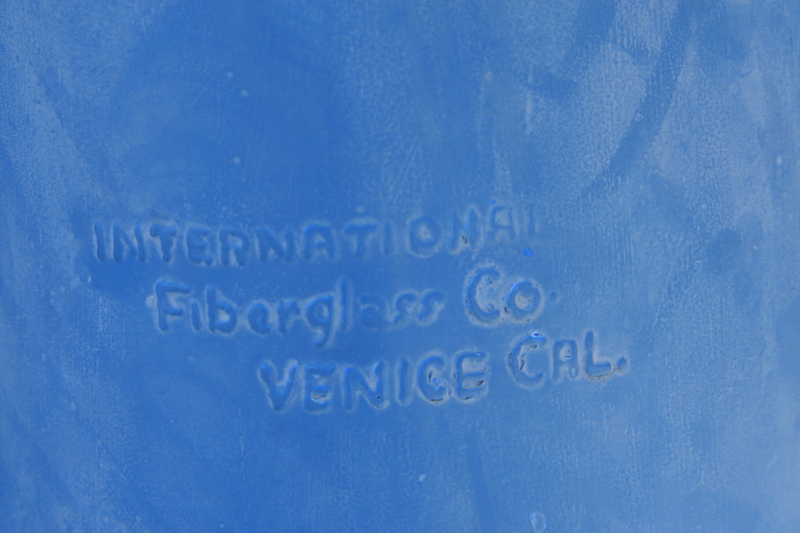 Within a few years, International Fiberglass had modified the Bunyan mold to produce Cowboys for Phillips 66 stations, Indians for Mohawk stations and Pontiac dealerships, and Vikings for Viking Carpets. The company also produced Uncle Sams, Pioneers, Pirates, Alfred E. Neumann look-alikes, as well as other customized statues. International Fiberglass also produced a giant female statue for Uniroyal Tires. By the time the company folded in 1972, there were hundreds of these statues on display. Today, there are about 180 of them left in the U.S. There are another half dozen or so in Canada, Mexico, and Puerto Rico. While it is believe that all of the original molds were destroyed, new molds have been created to replace damaged body parts. A few statues have even been completely built with reproduced molds. 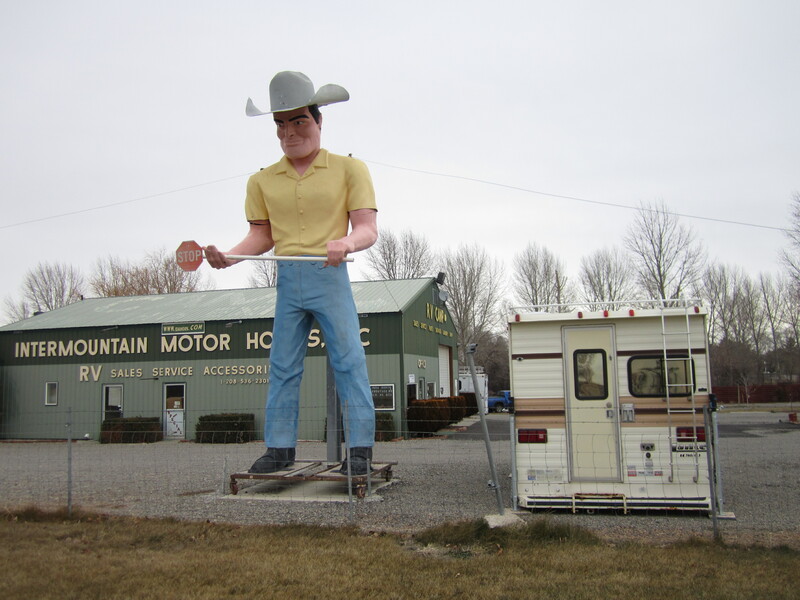 The very first Muffler Man produced is still in Flagstaff. It now stands outside the J. Lawrence Walkup Skydome at Northern Arizona University. That statue was built in one piece. 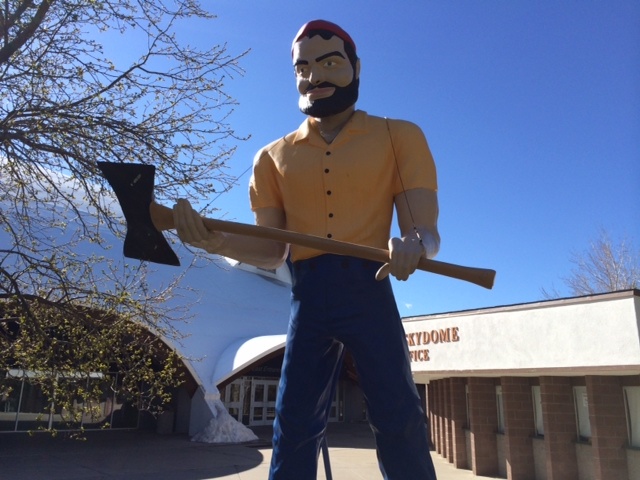 The other Paul Bunyan statue at NAU also came from the Lumberjack Cafe. The restaurant bought that one just a few years after the first one. By then, the statues were produced in four pieces which bolted together. 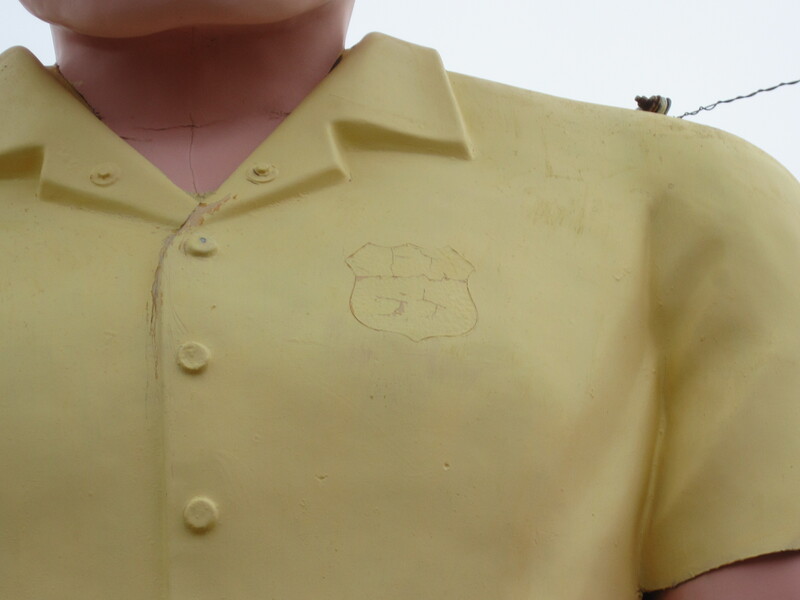 At some point, International Fiberglass changed the way that the statues’ arms fit into the shirt sleeves. Many of the earliest statues are still located in the Los Angeles area. I want to thank Gabriel Aldaz, the author of Right Palm Up, Left Palm Down, for the use of his photo of Bob Prewitt. Credit must also go to Roadside America.com for the information they have gathered over the years and the photos they have shared with me. 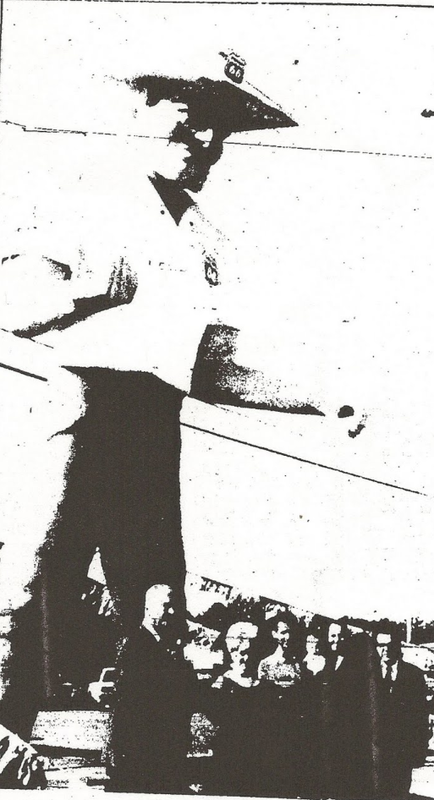 Terry Nelson, a former employee of International Fiberglass, has also kindly shared his memories as well as vintage photos and advertisements. Thanks also to Debra Jane Seltzer of RoadsideArchitecture.com for her help editing this post.